Healthy Lemon Poppy Seed Muffins | Low Carb! The first time I tried a lemon poppyseed muffin was when I created these Healthy Lemon Poppy Seed Muffins, and I now understand what I had been missing all this time. I've always personally been a boring bran muffin kind of girl, but now I'm a sassy, zesty lemon poppy seed muffin kind of girl, and I now have a lot more fun! These muffins are moist and packed with delicious flavor. Watch me make them below and share them with your friends and family! Muffins are one of the easiest grab and go food, especially if you bake them in little muffin paper cups. You just peel and eat wherever, whenever! I've even mentioned before how easy they are to make. All you really do is combine everything, scoop into a greased muffin tin and they come out ready for on the go. With these muffins, you can't go wrong even if you adjust thee flavors. You like more lemon, up the lemon. You like more poppyseed, up the poppyseed. We've given you the perfect muffin base so you can honestly add any flavors to the base and come out with the perfect muffin every time. All Kinds Of Low carb Muffins! We don't just do sweet muffins around the KetoConnect household. We've got muffins for all your moods! In my opinion, these lemon poppy seed muffins are a perfect afternoon snack. So, what if you're looking for breakfast? Make our High Fiber Muffins. Looking for lunch? Make our Pizza Zucchini Muffins. What about looking for dessert? Make our Low Carb Chocolate Muffins. Like I said, all your moods and times of eating are covered! To be completely honest, these muffins may look a little familiar if you've made another one of our recipes. We used the recipe from my all time favorite dessert, Olive Oil Cake, as the base for these muffins. The cake has a dense, moist, rich flavor that we knew would not only repurpose well for a great muffin, but would make the best healthy lemon poppy seed muffins! 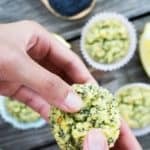 Recipe can be quickly added to MyFitnessPal - Search "KetoConnect - Lemon Poppyseed Muffin"
In one bowl combine the olive oil, eggs, lemon juice, and lemon zest. In another bowl combine the coconut flour, erythritol, baking powder and salt. Add the dry ingredients to the wet in two batches as you combine. Add the poppy seeds and combine again. Grease a muffin tin or place muffin cups in the tin and evenly distribute the batter among 12 muffins. We like to use a cookie scooper! Place in a 350 degree oven for 20-22 minutes. Allow to cool before digging in! Store in a ziplock or sealable container in the fridge up to 2 weeks or freeze up to two months.